Are you interested in becoming a lifeguard or swimming instructor? Have you been researching what courses to take or how to apply for jobs in aquatics? If so, then we made this resource just for you! In this article I will teach you how to become a lifeguard and swimming instructor with a simple step by step guide. Within a few minutes you’ll know exactly the path you need to take to get your first lifeguarding/swim instructor job and how much you should expect your income to grow as you gain more experience in the industry. What Skills and Courses Do I Need? The path to becoming a lifeguard and swimming instructor is relatively simple. You’ll start by signing up for the certification courses that all lifeguards and swimming instructors are required to have. These courses may seem expensive but if you consider them to be an investment, they will pay off in the long run when you land a high paying job. 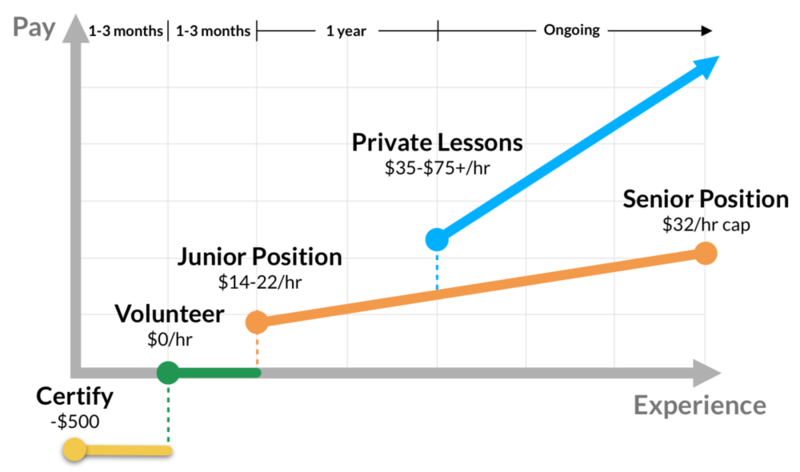 Once certified, you should consider getting some volunteer experience, especially if you have never had a job before. This will not only bolster your resume when it comes time to apply for a job, it will also give you an opportunity to show off your skills directly to the manager who may be considering your application. Once you’ve landed your first job, your pay and shift options will be tied to your level of seniority, increasing slowly with time or your number of hours worked. After you’ve worked for at least one year, you should consider teaching your own private lessons on the side while you continue to guard at your current job. By listing through a platform like Propel, you will be able to set your own price and take advantage of the high demand for swimming lessons and your particular skill set. Before you can get a job in aquatics you’ll need to get properly certified. As a general pre-requisite, you will need to be a good swimmer. To learn quickly, try signing up for private lessons and let your instructor know that your goal is to become a lifeguard or swimming instructor. It’s important to know that most facilities will not hire you for a first job unless you are qualified as both a lifeguard AND a swimming instructor. That said, since facilities make money by running courses, they’ll often tell you to take every possible course to “improve your chances of getting hired”. To save you some money and keep you from taking courses you’ll never use, we’ve separated out courses that should be considered optional. *Aquafit is in high demand and can help get you a job much faster. Having already certified, you will know the principles of safe lifeguarding and swim instruction but without real world experience, most employers will not be willing to hire you to guard or teach by yourself. To get more experience, most facilities will allow you to shadow a current staff member so that you can watch how they put those learned principles in action. After observing a few times, you should be able to start volunteer guarding or teaching, usually under the watchful eye of a manager. Throughout this process you should be asking for feedback about how you are doing and relaying that into a conversation about when the manager thinks you’ll be able to start in a paid position. If you don’t volunteer, then applying to aquatics jobs is just like applying to any other job. Make sure you create a resume that is well formatted, free of spelling errors, and highlights that you have all the necessary certifications as well as any relevant work experience. Feel free to drop by your local pool or swim school with printed copies of your resume in hand and ask to speak to a manager if possible, rather than just handing in your resume and hoping for the best. You can also apply online, see our list of hiring resources below to find job postings near you. Most public and private pools have one large hiring once per season. If you miss the cutoff for one season, apply and ask about when you can expect to receive a follow up. If you do get a call back, you will likely need to attend a job interview and wet screening. These will be opportunities for managers to get to know you better to see if you will be a good fit for the team. Wet screenings also test your abilities in the water, so make sure you don’t get rusty if it’s been awhile since you’ve taken the certification courses. If you don’t receive a call-back or you don’t get offered a job after a wet screening, don’t give up! Ask the management for feedback about your performance, let them know that you’ll work on it and then re-apply. If you lack the necessary experience, ask if you can volunteer teach or guard. Be persistent about the fact that you are willing to put in the work to get the job and given enough time, they will most certainly give in and give you a chance. We want you to have a great career in aquatics and so we’ve compiled a ton of useful resources to help you along the way.